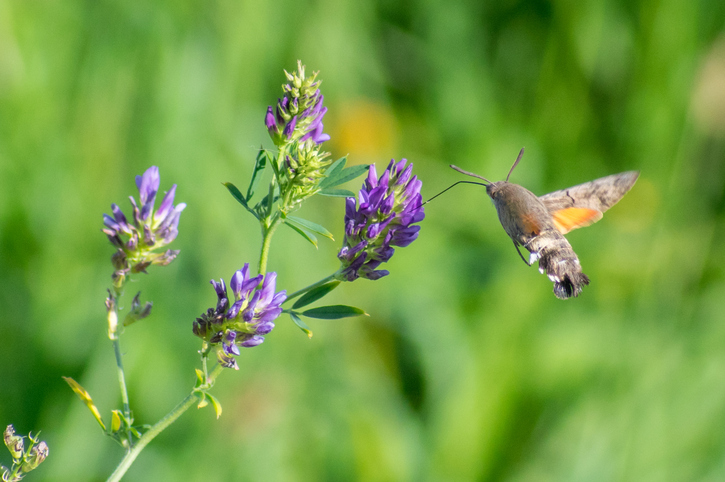 Hummingbird moths flap their wings very fast so they can hover while they feed on flowers. To flap means ‘to move back and forth loosely’ or ‘to move up and down,’ like wings or arms. As a slang term, ‘to become excited or confused,’ usually because of stress, is also to flap. As a noun, a flap is something flat and broad that hangs loosely attached on only one side or covering an opening. The movement or the sound that a flapping movement makes is also a flap. As a slang term, a state of excitement, an emergency situation, or a scandal, can be called a flap as well. The boss was flapping over getting the project finished on time. The jacket's pocket is covered by a flap. With a flap of its wings, the bird took flight. The only sound in the garden was the flap of the wash hanging on the line. Everyone was in a flap, preparing for the celebrity's visit. The politician's affair caused quite a flap in the media. catflap: a flap set into a door that a cat can push open to go in or out. mudflap or mud-flap: a rubber flap hanging behind the tires on trucks to prevent mud from splattering the cars behind them. A flapjack is a sweet tray-baked bar made from oats, butter, sugar, golden syrup and various other ingredients. Flapjack is the UK name for this sweet treat. In the US, they are called oat bars, and Australians and New Zealanders know them as cereal bars or muesli bars. Whatever you prefer to call them, you can try making them yourself if you like; here‘s the recipe. If you can’t get golden syrup, you could try substituting runny honey or agave syrup. In some parts of the US, pancakes are called flapjacks, so be mindful of where you are when you ask for a certain food. Flap dates back to the late 13th or early 14th century. The Middle English verb flappen is probably of an imitative origin, though we don’t know whether this happened in English or by influence of another language. Though it is not related to similar words in other languages in the traditional sense, there are similar words in other languages, like the Dutch and German flappen (verb) and flap (noun), because they emerged from an imitation of the same sound. It originally meant ‘to shake,’ ‘to dash about’ or ‘to beat the wings,’ but expanded to ‘to strike or hit’ by the mid-14th century. The sense ‘to swing about loosely’ dates back to the early 16th century. The noun dates back to the early to mid-14th century. The Middle English noun flappe originally meant ‘a blow or slap,’ and may have come from the verb, though it’s also possible it emerged in parallel. The sense ‘a device for slapping’ is from the early 15th century, while ‘something that hangs down’ dates back to the early 16th century, and is probably related to the verbal sense from that time. The meaning ‘the motion or noise of flapping’ appeared in the late 18th century, and the slang sense ‘commotion, noisy tumult or disturbance’ is from early 20th century British slang.